Violent clashes erupted in Bangladeshi capital after scores of people flooded the streets protesting against a US-made anti-Islam film, despite a 24-hour ban. 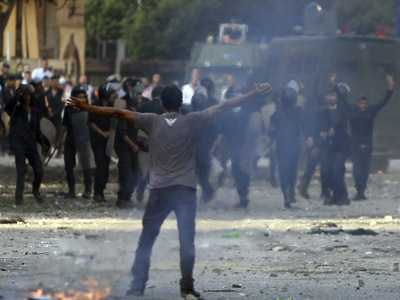 Police used teargas to disperse a stone-throwing crowd. Dozens sustained injuries. ­Hundreds of Islamist protesters tried to stage an anti-American rally in the capital city of Dhaka on Saturday morning. Police had to use teargas and batons as the out-of-control crowd attacked security forces, torched vehicles and damaged a police van. Local English newspaper Daily Star put a number of those injured in clashes to at least 30 people, including law enforcers, and the number of arrested at 40 protesters. ­The violence initially started inside the press club building after leaders and activists of the Islamic parties assembled there tried to hold their protest, the online edition of the newspaper reports. They attempted to emerge from the press club in a procession, but police barred them because of the 24-hour ban, which was imposed by Dhaka Metropolitan Police (DMP) late Friday. The restriction prohibits all protests near the city's main Baitul Mokarram mosque to avoid mass unrests. Some of the protesters responded by throwing brick chips at the police from inside the building. At the same time, others came out to clash with the security forces, halting the traffic on the road nearby. Police cordoned off the three gates of the press club and detained the leaders and activists who tried to leave the premises. “They defied our ban and tried to stage a protest against the anti-Islam film. At one stage, they started pelting stones at policemen,” AFP quotes Dhaka police spokesman Masudur Rahman as saying. The alliance which staged the protest has called a nationwide strike on Sunday to continue mass demonstration against the film Innocence of Muslims and French cartoons mocking the Prophet Mohammed, which both have stirred mass outrage across the Muslim world. ­The latest violence comes a day after some 1,000 Bangladeshis took the streets of the capital. 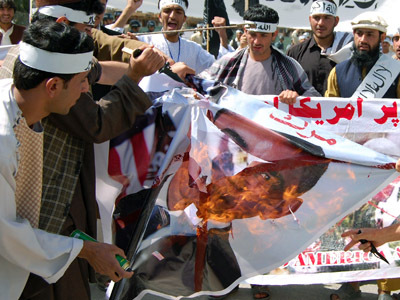 The protests burnt down a “coffin of Barack Obama” covered by the US flag along with the effigy of the American president. Activists of different Islamic political parties also staged a mock hanging of Sam Bacile, the alleged filmmaker behind the anti-Islam movie, AP reported. 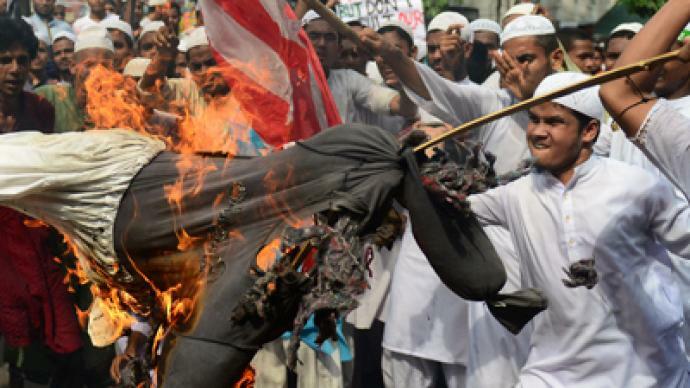 Protesters also burnt a French flag in response to cartoons of the Prophet in a French magazine. Demonstrators also carried portraits of US President Barack Obama and American and Israeli flags. 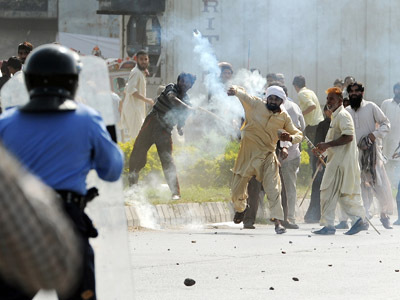 In Pakistan violent protests continued Saturday, a day after deadly clashes ended up with around 20 people killed and more than 200 injured. The crowd of about 1,500 people, including women and children, peacefully rallied in Pakistan's capital, Islamabad. They later gathered near parliament building, chanting anti-US slogans and demanding a strict punishment for the filmmaker. A cabinet minister offered a $100,000 reward for the death of the film’s director. 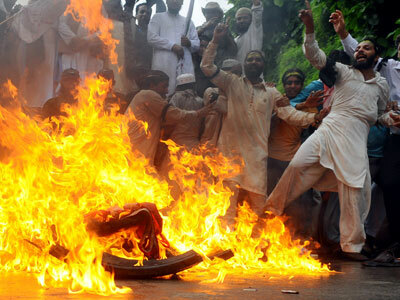 Innocence of Muslims, a low-budget film made in California, has triggered a wave of bloody anti-American protests in more than a 20 countries across the Muslim world. Violent mass demonstrations have been lasting for more than 10 days, leaving scores of dead and injured.